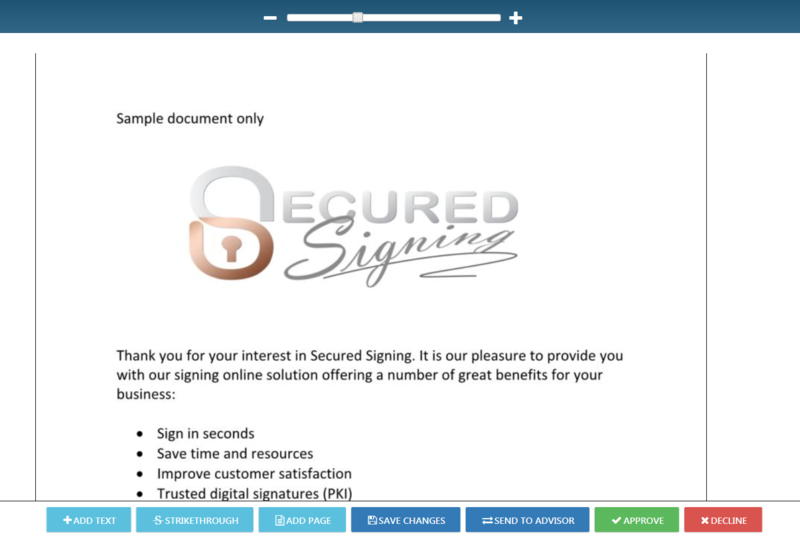 Secured Signing provides a complete document workflow from negotiation, review and through to secure digital signing. Including document negotiation as part of the signing workflow is a quicker, more secure and simpler way to finalise the details of your agreement. The seamless transition from negotiation to signing ensures the agreed document is signed without delay. 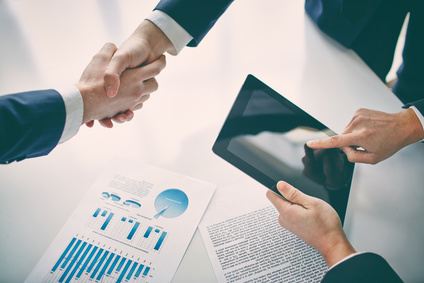 Document negotiation replaces messy, confusing email trails with a flexible, structured negotiation process that ensures people are always working from the most recent draft and quickly progresses to a final agreement. All parties to the document can add comments and markup the draft agreement with all amendments initialled with that person's digital signature. All amendments must be approved by all parties to finalise the negotiation process. The negotiation iterates through as many rounds of amendments and approvals as is necessary to reach an agreement. Each negotiator may also choose to send the document to an advisor for their comments. The advisor can add their comments and markup the draft agreement on behalf of their client. Once the advisor has completed their review, the signer is notified, allowing them to finalise their changes to the document and approve. As soon as the negotiation phase is completed, the document is signed by all parties. The digital signature seals the document from any subsequent changes. The document owner adds the document to Secured Signing, invites the relevant parties to sign the document and selects the checkbox to enable document negotiation. The first signer receives the invitation to negotiate and clicks through to the document, reviews it and marks up the document as required. They can also choose to send the draft agreement to their advisor for input. The first signer clicks Approve to submit their changes for review or acceptance by the other parties to the document. The process continues until all signers have reviewed and agreed all the changes made by all parties. The document signing process commences with all parties sealing the document form further changes with their personal, PKI digital signature. The next signer receives the invitation to negotiate and reviews the changes from the first signer as well as making any changes required to the document. A digital signature provides the highest form of signature and content integrity as well as universal acceptance. Digital signatures are based on Public Key Infrastructure (PKI) and are a result of a cryptographic operation that guarantees signer authenticity, document’s data integrity and non-repudiation of signed documents. The digital signature cannot be copied, tampered or altered and can be verified. On the other hand, an electronic signature is a proprietary format (there is no standard for electronic signatures) that is an electronic data, such as a digitised image of a handwritten signature, a symbol, voiceprint, etc. that identifies the author of an electronic message. Electronic signatures are vulnerable to copying and tampering, making forgery easy. For document security digital signature method is the best way to sign and seal and document. Add Text - Additional text can be added and positioned in the document as required. Strikethrough - Text that needs to be excluded from the agreement is marked up with a strikethrough. Footnotes - Notations and other comments can be included as a footnote with a reference placed against the relevant part of the agreement. Add a Page - There is no limit to the additional clauses or paragraphs added to the original agreement. Additional pages can be appended as required. Save - The signer can save the changes made to the document at any time and return to the document review by again clicking the link in the invitation email. Send to Advisor - Each signer may choose to also refer the document to an advisor for their changes and comments. Approve - Once all the required changes to the document have been made, the revised agreement is approved to submit to the other parties for review and approval.